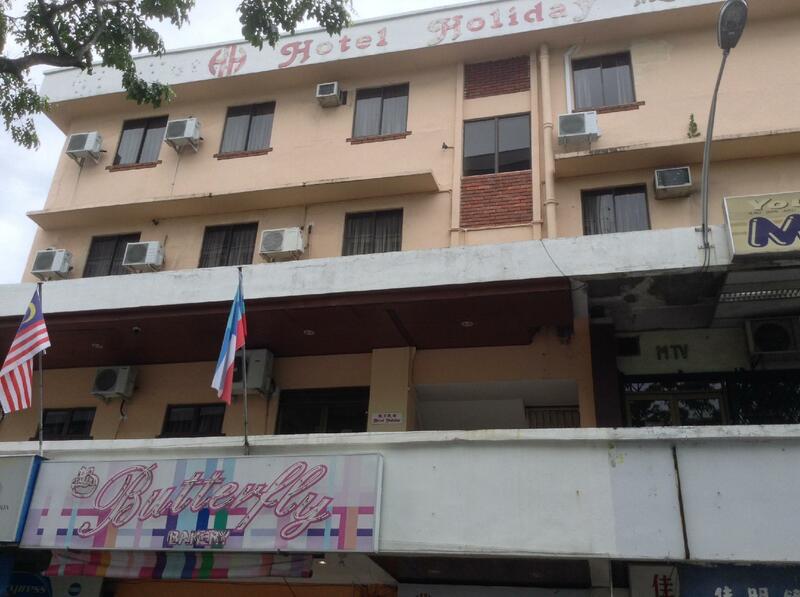 Ada pertanyaan untuk Hotel Holiday Kota Kinabalu? Jika apa yang Anda cari adalah properti yang terletak strategis di Kota Kinabalu, pilihlah Hotel Holiday Kota Kinabalu. Dari sini, para tamu dapat menikmati akses mudah ke semua hal yang dimiliki oleh kota yang aktif ini. Properti ini terletak di sekitar obyek wisata populer di kota ini, contohnya Segama Waterfront, Monumen Sword Fish, Pasar Minggu Gaya Street. Hotel Holiday Kota Kinabalu menawarkan pelayanan sempurna dan segala fasilitas penting untuk memanjakan para wisatawan. Para tamu dapat menikmati fasilitas di tempat seperti layanan kamar 24 jam, WiFi gratis di semua kamar, Wi-fi di tempat umum, tempat parkir mobil, layanan kamar. Masukilah salah satu dari 24 kamar yang menggoda di sini dan lepaskan rasa penat Anda dengan sejumlah fasilitas yang tersedia seperti akses internet - WiFi, akses internet WiFi (gratis), AC, meja tulis, bar mini. Properti memiliki berbagai pilihan fasilitas rekreasi yang memungkinkan Anda melakukan bermacam hal selama menginap. Ketika Anda mencari penginapan yang nyaman di Kota Kinabalu, jadikanlah Hotel Holiday Kota Kinabalu rumah Anda ketika berlibur. Very good location and clean. Cleaner even mops the staircase outside the hotel early in the morning. A bit noisy at night since the hotel is by the main street. If you don't mind the noise then it's a good place to stay for budget travellers. Please replace a new air-conditioning because the room was not so cool..
the rate of the room is worth for value of money besides its strategic location..nearby to halal and non halal restaurant.last but not least the staffs are helpful and friendly. I love the location! It's within walking distance to all markets. And near to jesselton jetty. Room is ok. Power point is only 3, 2 are used for TV and mini fridge. So only 1 left for u to charge your phone. So I recommend u to bring your own power extension. They provide kettle in room. Iron and ironing board can be requested from reception counter. You need to pay deposit upon check in and if there is no damaged or muissing itrem, they will refund the deposit back upon check out. This hotel got no elevator. So if you are travelling with elderly, this hotel is not suitable for them. Parking lots are based on first come first serve basis, near the hotel, and is chargable from 8am to 5 pm. 5pm to 8am is free. Overall for it is suitable for a short stay and the price is reasonable. The hotel is basic but got everything important such as mini refrigerator which is great. The receptionists were very helpful and smiling all the time, which made my stay even better. Will definitely come back again in the future. After one night at Kundasang, we decided to check in at the same hotel when we return to KK. Walking distance to Philipine Market and near the Night Market. Beside the shop lot, there is a fruits stall. Recommended to everyone. Good: Central location, Courteous staff, Clean rooms, Chilled Aircons, Multiple 24hr eateries around. Bad: No internet on 2nd floor, Main road facing rooms are extremely noisy as the traffic continues throughout the night. Just make sure to get a room facing back small road and have internet data in mobile. Then its a nice hotel and good value for money. Overall, we really love it and surely will come and stay here again. Pleasant staff, comfortable room, good service & of course, the hotel is really convenient where it is near to places that we have planned to go. Cheap and centrally located in the city. Nice customer service. The room was dark and damp. Staying inside for a long period of time is not recommended unless you want to feel like being prisoned in a weird dark cold room in the 90s. Deluxe doesn't look like a deluxe room. The hallway was messy probably due to high occupancy. Stairs. Would go to other hotels if given the choice. As for me the hotel only for sleeping purpose, Hotel Holiday has satisfied me a lot with their clean and not too small room, and a bathroom with a bathtub inside. The staff is friendly and committed. And the most important is the hotel is near to those major attractions, e.g Gaya Street, Central Market, Filipino Market, Suria KK, seaside, and nice and cheap restaurants like Upperstar Cafe and Bar. The only complaint is no hot water and drinking water supply in that hotel. it is very low budget hotel, but it really friendly staffs and very helpful too...situated just in the middle of plazas and shopping centre, it is very good location indeed for people who like to save money although there's no elevator provided..
very affordable price, though the building looks old..but it worth inside, very friendly staffs, very clean, and nice...located near shopping center...just walk around the area for few minutes and here we are..
Staff friendly,room clear, just need to do some maintenance for equipment such as air conditional got water leaking,but overall good. value for money..but the item inside the room quite old..aircond not function well...at night around 12.00-2.00 AM quite noise with people outside.. overall it ok if u want to stay on short period or just transit before you go to kundasang. near to pasar basar, waterfront, gaya market, seafood stall.. all just walking distance.